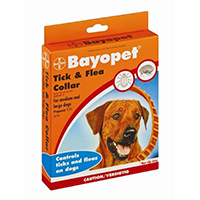 Bayopet Tick & Flea Collar is a flea and tick preventative collar specifically developed for dogs. It is effective in controlling ticks in the environment for 10 full weeks and 16 weeks on fleas. It works quite quickly and kills ticks within a day of administration. Its effect can be seen within a few hours of fitting the collar.